An already familiar WINTER OLYMPICS story. ABC: AMERICA’S FUNNIEST HOME VIDEOS aired its first new episode in a while, and was up from recent reruns to 1.0. 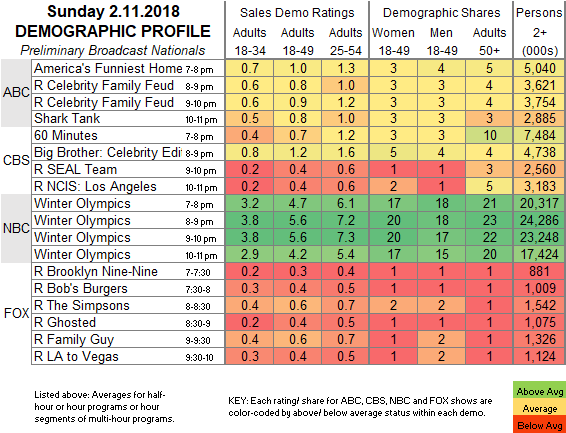 After 0.8/0.9 CELEBRITY FAMILY FEUD reruns, SHARK TANK was at 0.8, down from the 1.1/0.9 ratings from a pair of episodes 2 weeks ago. CBS: 60 MINUTES aired a regular episode for the first time in several weeks, and was at 0.7. BIG BROTHER: CELEBRITY EDITION rose 0.2 from Friday’s installment to 1.2. 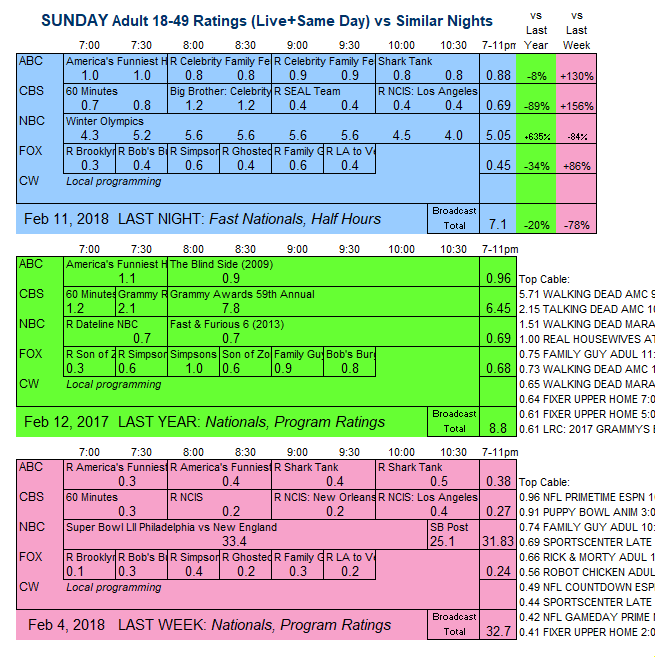 Reruns at 0.4/0.4 followed. Tonight, several networks air original programming against the Olympics, with THE BACHELOR on ABC, BIG BROTHER: CELEBRITY EDITION on CBS, and the replanted ‘LEGENDS OF TOMORROW on CW.